Our Future Rooted in Our Past: Are you needing a PAF Guru? Are you needing a PAF Guru? What is a PAF Guru? By definition, being a guru means a person who guides, counsels, or mentor. 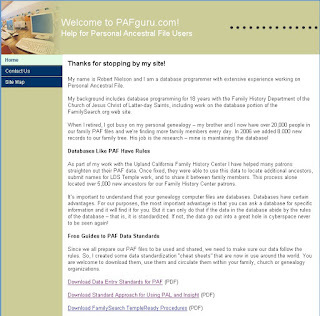 Having said that a PAF (Personal Ancestral File) Guru is a person who is able to help you with your PAF genealogical database or the program. Rob Nielson a database programmer has significant experience with working in the PAF environment. His extensive knowledge and expertise from working on his on family database but also others, has resulted in development of three helpful guidelines for genealogists in cleaning up their database. Although these guidelines have been developed for those using PAF, the basic guidelines apply to any genealogical program that you might be using for organizing your database. Rob has graciously allows downloading of the PDF files and circulation withing your family, friends, and genealogical groups. If you have difficulty with understand the how's and why's of the PAF program, Rob will also for a fee, clean up your database for you. He is able to accomplish this through emailing of your file to him, cleaning up the database and finally the returning your file to you through email. If you are interested in these PDF Guides, click here.